Taptive™ user interface provides simple, animated guidance to eliminate incorrect reference setup and "negative loss" errors. Statement of Calibration and Getting Started Guide. The CertiFiber Pro Optical Loss Test Set improves the efficiency of fiber optics certification. 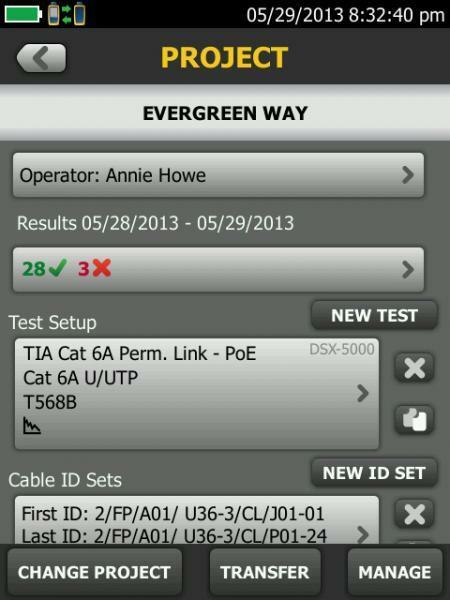 The Taptive user interface simplifies set-up, eliminates errors and speeds troubleshooting. A set reference wizard ensures correct reference setting and eliminates negative loss errors. Built on the future-ready Versiv platform, CertiFiber Pro OLTS provides merged Tier 1 (Basic) / Tier 2 (Extended) testing and reporting when paired with OptiFiber Pro module. A convenient quad module supports both singlemode and multimode and is multimode Encircled Flux compliant. Copper certification and Wi-Fi Analysis and Ethernet troubleshooting modules are also available. 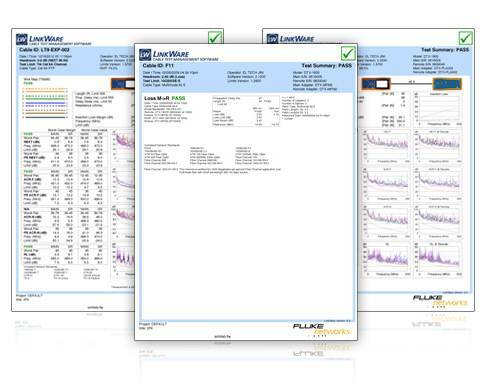 Analyze test results and create professional test reports using LinkWare Management Software. Set-up or view test limits, fiber types, and testing attributes. View multiple projects. Select a project icon to seespecific detail.